The NSCC Foundation presented the college with a record-setting check in the amount of $808,682 during the Board of Trustees meeting in Archbold. Pictured, from left, are Robbin Wilcox, Executive Director-Development and NSCC Foundation; Peter Beck, NSCC Foundation Board chairperson; Jeffrey Erb, NSCC Board of Trustees chairperson; and Dr. Michael Thomson, NSCC president. The Northwest State Community College Board of Trustees met in regular session on Aug. 24. on the Archbold campus. 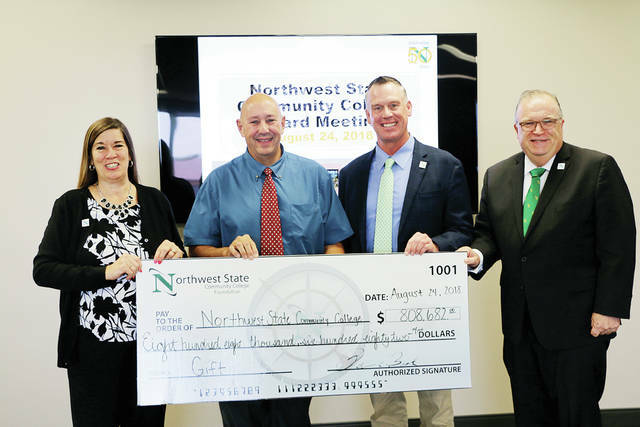 As part of the meeting, Robbin Wilcox, executive director of Development and the NSCC Foundation, and Peter Beck, NSCC Foundation Board chairperson, presented a record-setting check for $808,682 to the college from the Northwest State Community College Foundation. The money is designated for student scholarships, equipment, STEM outreach programs, and support for students. Over $4 million has been provided through the businesses and individuals who have supported the Foundation over the past 10 years. Beck noted that the support comes from within the NSCC campus, as well as throughout the community. The NSCC Foundation has approximately 30 board and committee members representing Fulton, Defiance, Henry, Paulding, Van Wert, and Williams counties. Information can be found online at NorthwestState.edu/nscc-foundation/. • The employment contracts of Ashlynn Cox, Accounts payable clerk; Donald (Chris) Gomez, technician, Network/Systems Technology; Kayleigh Nofziger, assistant, Financial Aid; Megan Leppelmeier, administrative assistant, Arts and Sciences division; Tracy Deblin, student accounts receivable clerk; Erin Jacob, clinical teaching assistant, nursing; and Linette Will, nursing faculty. • The transfer contract of Annette Oberhaus, coordinator, Nursing Lab. • Title changes of James Drewes, executive director, Workforce Development; Kathryn McKelvey, vice president, Human Resources and Leadership Development; and Robbin Wilcox, executive director, Development and NSCC Foundation. • Miscellaneous employment contracts and resignations. • The college to locally administer the building B renovations – $2.329 million – as required for capital projects under $4 million. • A motion that “guest” and other student populations as a group that will not utilize the services funded by the Career Advantage Fee and Career Service Fee for new students will now be exempt from being assessed those fees. https://www.swantonenterprise.com/wp-content/uploads/sites/23/2018/08/web1_NSCC-check.jpgThe NSCC Foundation presented the college with a record-setting check in the amount of $808,682 during the Board of Trustees meeting in Archbold. Pictured, from left, are Robbin Wilcox, Executive Director-Development and NSCC Foundation; Peter Beck, NSCC Foundation Board chairperson; Jeffrey Erb, NSCC Board of Trustees chairperson; and Dr. Michael Thomson, NSCC president.